Read on for our fun things to do in St. John, US Virgin Islands! 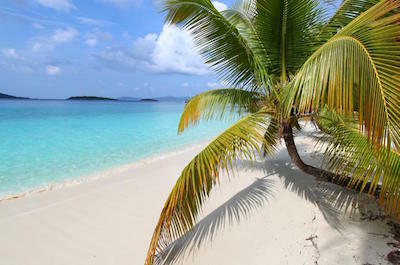 Have a vacation with a difference on the exotic island of St. John. It offers everything from watersports to hiking and shopping. Go touristy on a trendy beach or escape to a secluded paradise islet with azure blue waters. Explore underwater reefs and walk along miles of pristine sands. Learn about the chilling slave trade and the massive sugar cane industry. Sample famous beers, fruity cocktails and traditional Caribbean cuisine and create memories to last a lifetime. The sun is shining, warming your skin as the crisp salty air fills your lungs. The breeze tickles your hair as you sit on the deck of a luxurious sailing boat sipping on a traditional cocktail. Sound good? Taking one of the wonderful cruise and boat tours on offer is one of the best things to do in St. John. Spend a day cruising to the British Virgin Islands and Jost Van Dyke complete with lunch at Foxy's, the local's favourite sea-side restaurant. Dock at Virgin Gorda and snorkel among the colourful coral just off the shore or frolic in the tidal pools, hidden grottoes and tunnels that make this a sort of natural adventure park. Head back into the ocean and spot glorious schools of tropical fish that call Diamond Reef home. You may even spot a sea turtle or manta ray, so keep your eyes peeled! Spend a full day out and about in the glorious Caribbean sun, visiting different British Virgin Islands on this adventure filled excursion. 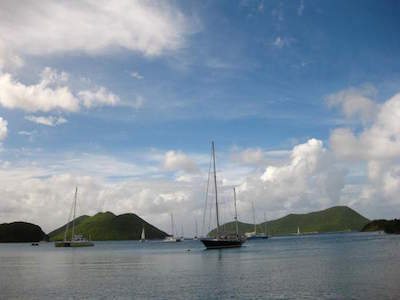 One thing to do in St. John is to climb onboard a boat and set sail to one of the first of many stops on the Day Cruise to the British Virgin Islands from St Thomas or St. John Tour. Kick off your day with a hearty breakfast before your boat docks at Virgin Gorda known for its white sandy beaches and beautiful rock formations that make up a natural water park. After splashing about in the tidal pools do a bit of snorkelling around Diamond Reef that is thriving with colourful marine life. Next head to Jost Van Dyke Island for an exotic cocktail at the beachside bar. We recommend the "painkiller" cocktail. Before heading back to port, browse the local shops and have a bite to eat before settling down to work on your tan back on the boat. Grab your snorkelling gear and get a little wet. 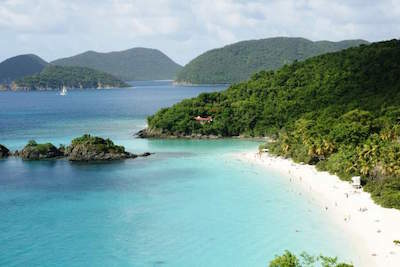 With snorkelling being one of the best things to do in St. John, the question will not be if, it will be when! With so many tours to choose from, you can decide whether you just want to spend the day snorkelling or add an activity such as kayaking or hiking to your day. 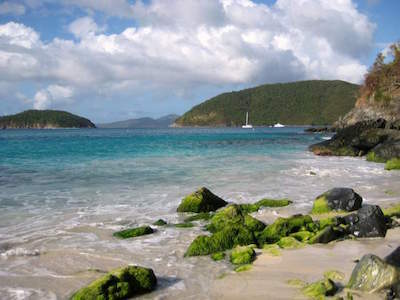 If you are all about seeing the world from a sea turtle's eye view, take the Snorkel Gear Rental in St. John Tour and set off on your own to explore the island on your terms. Included in your rental is all the necessities and you will be flippering like a dolphin in no time. Discover beautiful coral reefs, tropical fish, sea turtles and wondrous rock formations before settling down with a cold one at a quaint seaside bar. You will certainly have second thoughts about going home after this fabulous experience. Stretch out those arms and get ready for some adventure. 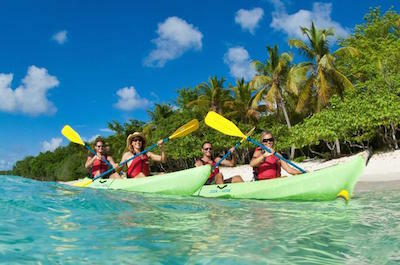 For sports lovers, kayaking is one great thing to do in St. John and makes a unique and unusual way to see the island in all its glory. Set off on a day of excitement from Honeymoon Beach where your guide will assist you with your kayak and paddles and always be close by for your safety. Once ready to go, you will paddle out into the crystal clear water and across the shimmering bay. After a short while, you will reach Henley Cay, completely uninhabited with a magnificent sense of tranquillity. Relax on the sandy protected shore or plunge into the water for some snorkelling. Colourful coral juts out of the rock and teems with tropical fish. After your snorkelling adventure set off along Henley Cay's trail that offers incredible views of the British Virgin Islands. Take a moment to breathe it all in before heading back to your starting point. 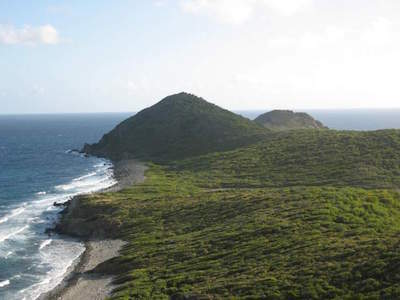 The Virgin Island National Park stretches over most of the St. John island and it is quite amazing that this richly thriving environment was once a site that was cleared for sugar plantations. 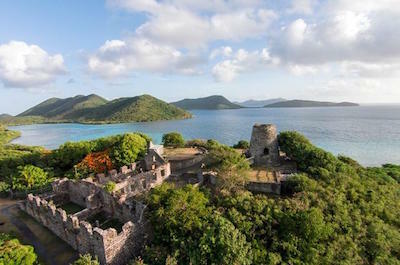 Hiking one of the hiking trails and visiting one of the historic sites like the Annaberg plantation ruins are just some of the great things to do in St. John. The trips are suitable for all ages and you need not be super fit. Head through dense vegetation down to one of the favourite beaches called Trunk Bay, located on the north western side of the island. Cool off with a refreshing swim after your 2-hour hike or continue on to Hurricane Hole which is a amazing mangrove bay and a perfect spot for snorkelling. If you prefer to have a guided tour, join the Caneel Bay Kayak, Hike and Snorkel with Sea Turtle tour where your guide will be with you every step of the way pointing out little gems on the island. You are sitting in the office, flipping through a holiday magazine when you turn to a photograph of the perfect tropical beach. Clear waters shimmering in the light, palms swaying in the background and crisp white beach sand. Wow! 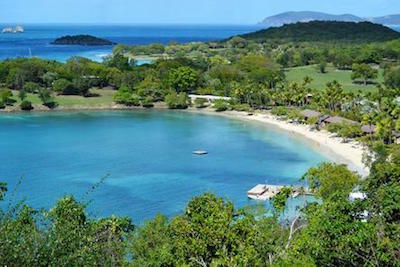 Caneel Bay is everything you see in that photograph and more! 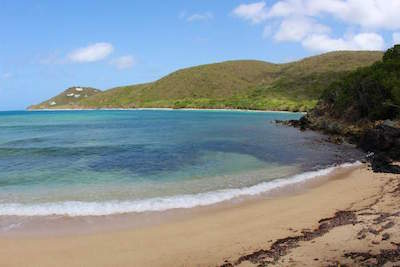 Just outside of the main port of St. Johns, Cruz Bay, you will find this little piece of heaven. Restaurants line the shore, fresh fruity cocktails waiting to be tasted. Once an old sugar plantation, this beach is now a hot spot for snorkelling and one of the great things to do in St. John. 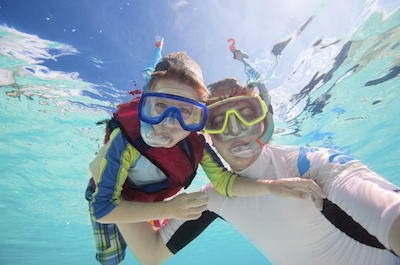 Hire your snorkelling gear and drift into the warm water. Look out for sting rays and even barracudas and don't forget your camera to snap a better picture than the one you drooled over in that holiday magazine. After soaking up the sun, take a walk to the nearby ruins of the old sugar works, lovers of history will find them fascinating! Enjoy a little bit of time out and take your family to Hawksnest Bay for the perfect day of picnicking and relaxation. The best thing about Hawksnest Bay is its position - the glorious morning sun warms the sand with shade arriving at the perfect time to cool things down. One thing to do in St. John is to test out your snorkelling skills and Hawksnest is the best place for beginners to do so. With the reef just a short way from the shore you will be snorkelling up a storm in no time. Discover colourful coral and stunning marine life. If you are more experienced, venture deeper out to discover more exotic creatures like sea turtles and sting rays. The beach has great amenities with restrooms, grills and a shaded picnic area. It does get busy so if you are looking for something quieter, simply head to Little Hawknest, a much quieter section lying to the west of the main beach. Want to impress your sweetheart? Head over to Maho Bay and spend some time in the water, another fantastic thing to do in St. John. Named after the Maho tree which you can easily recognise by its gorgeous heart-shaped leaves and yellow flowers it is the perfect place to relax with your better half. The narrow shore is situated in a protected bay on St. John's northern coastline and is ideal for yachts to drop anchor, creating a picture-postcard scene. Look out for lazy sea turtles drifting in the water and among the sea grass. Just off the shore is a shallow reef that is great for snorkelers to discover the beautiful marine life. Then take a casual stroll along the Goat Trail to see the Eco-Camps where a little enclave of tent cabins are placed. End the day with a romantic seafood dinner at one of the restaurants lit by candle light complete with delicious tropical cocktails. You will definitely be in the good books. 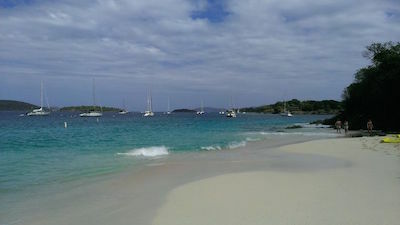 One of the first things to do after arriving in St. John is to visit Cruz Bay. Known as Love City, this gorgeous destination has a unique laid back and casual atmosphere, with a vibrant town square and a fun beach. 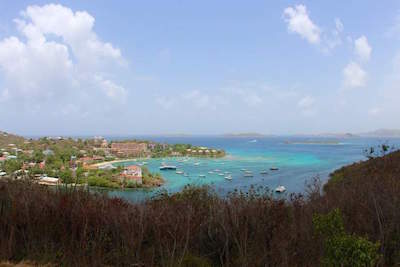 Cruz Bay is the main town and is close to the ferry docks, making it easily accessible for the whole family. The surrounding hills are full of hotels and apartments, making this a focal point. Stroll around the town square and browse through the quaint shops, stop at a restaurant for a bite and a bar for a refreshing drink. 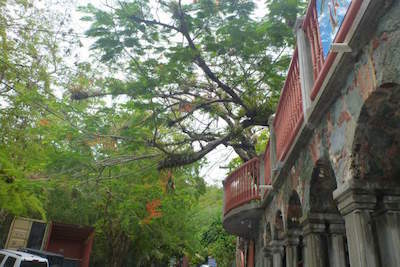 Mongoose Junction is the perfect place for a bit of shopping with a mixture of Spanish architecture and Caribbean vibe. Visit stores selling locally made goods and artworks. Browse for gorgeous jewellery and pick up a gift for a special someone at home. Then venture down Wharfside Village and King Street for more retail therapy before heading back to your hotel. 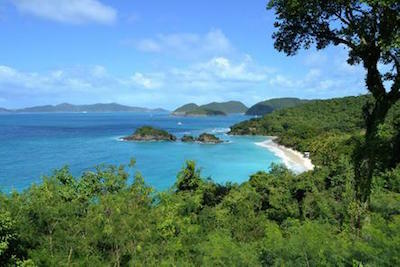 Trunk Bay, the unspoilt paradise of the Caribbean. Declared unique by National Geographic and one of the top ten beaches in the world by Conde Nast Traveler, this picture perfect slice of heaven is the perfect thing to do in St. John to spend some time away from the hustle and bustle of the city. With silky soft sand, clear blue waters and glorious green vegetation as its backdrop, Trunk Bay is a popular spot to snorkel and walk along one of the many trails along the sea. It is located in the heart of the Virgin Islands National Park ensuring that this glorious place has yet to be touched by modern day construction. Taking the Half-Day Tour to Trunk Bay is one of the most highly recommended things to do in St. John as you will be shown the perfect places to snorkel. There are marked underwater trails, ensuring that you don't miss a thing! When you are done, relax on the beach with your guide, listen to local stories and catch the most wonderful tropical sunset. Looking to get away from the busy Cruz Bay? Spend a day at Coral Bay, a beautifully protected cove alongside Coral Harbour. It is secluded and quiet with only a few quaint picturesque houses on the green slopes that surround the Bay. One great thing to do in St. John is to explore the old Moravian Church built in 1750, famous for its red roof. This is the perfect place to take it easy and experience life as the locals do by enjoying some local rum at an easy going bar or a bite to eat at one of the cozy restaurants. For sports lovers, there are some great snorkelling spots nearby at Salt Pond Bay. If you prefer to relax, you can spend some time on the beach at the secluded Lameshur Bay. 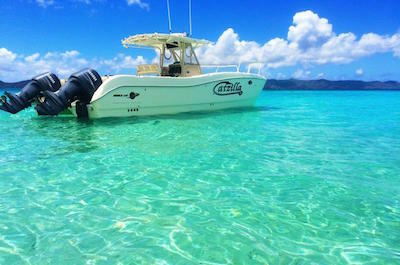 If you are up for a bit of adventure, why not charter a boat out to the nearby British Virgin Islands with an enthusiastic local guide offering you interesting anecdotes as you cruise along. Honeymoon beach is a quiet little gem, a perfect thing to do in St. John for those who want to avoid the crowds of the busier beaches of St. John. Accessible by a number of gorgeous walking trails, the beach is perfect for a number of water activities. Grab a kayak and take a paddle through the crystal clear waters as the sun warms your skin and the crisp air whips through your hair. Paddle a short way up the coast and slip on your flippers and snorkelling mask before plunging into the water to swim alongside tropical fish and dart among the coral and rock formations. Head back to shore for some "me time' and relax on a hammock shaded by a large palm tree as you sip on a delicious cocktail decorated with fresh fruit, or be daring and choose to do this on a thick wooden raft drifting off the shore! Close your eyes and sway in time to the local music that gently fills the air around you from a nearby beach bar. Pure Bliss. Head off to what seems like a completely different world. 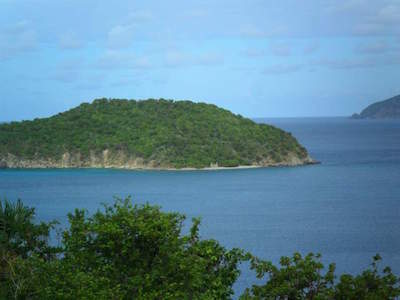 A great thing to do in St. John is to visit Helen Cay. Embark out to sea on a boat to the 11 isles situated in crystal blue waters making this the perfect spot for snorkelling and kayaking. The magnificent reef is situated in shallow water and marine life can easily be seen even from the shore. This venue is classed as one of the best snorkeling spots in the world. You will be amazed by the colourful corals and tropical fish such as the angelfish, parrotfish, surgeonfish and wrasse that live here. 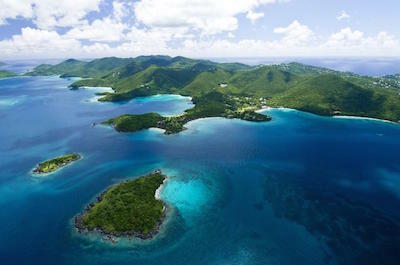 If you are fit, join a tour that paddles in a kayak to Helen Cay from Caneel Bay! Your guide will update you on the way and you will learn all about different types of corals, which is an unmissable fun thing to do in St. John for the curious. Become an expert in brain, sheet, star and staghorn varieties. After exploring the waters, hike up to the highest point for spectacular views. Helen Cay was believed to be home to locals back in the 18th century but is uninhabited today, making this a super special place! Take a guided tour and explore one of the largest facilities on the island that produced sugar, rum and molasses, a really interesting thing to do in St. John. Today the sugar plantation is sadly only ruins, but it is an important part of St. John's history. Trails lead visitors through the plantation past iconic structures such as the slave quarters, windmills and the remains of the factory. With your knowledgeable guide leading the group, you will get an insiders view of what life was like back then. Learn how slaves were brought in to clear the slopes of the hillsides for farming and how they were involved in the production of the sugarcane. See the remains of the 16 slave cabins made from branches held together with a mixture called daub, made from lime, coral and mud. When the slave trade was abolished, Annaberg was split up into a number of smaller farms. This is a fun thing to do in St. John and a richly rewarding experience to understand the history of the Island. Shop till you drop and shopping for authentic Caribbean products is one of the favourite things to do in St. John. Set off to Mongoose Junction, the island's best shopping and dining destination. Packed full of fabulous local stores, you will have a great time browsing furniture, art, clothing, jewellery, sculptures and pottery. Beer lovers must pop into St. John Brewers, a classic micro-brewery and bar and taste the locally brewed craft beer. Offer non-drinkers some root beer or ginger beer for fun. Visit Island Cork if you are more of a wine connoisseur and pick up a few bottles as a gift for friends at home. All this shopping will have certainly worked up an appetite so grab a bite to eat. If beef is your thing, head to the Tap Room, if not set off to Virgin Fire for more contemporary fare and don't miss out on their famous sauce, which is a must thing to do in St. John, that consists of locally grown mouth-watering peppers and Coral Bay Honey. Wash it down with a glass of cold root beer before heading back to your hotel. Delicious! Located on the south east coast of the Island is an idyllic setting of crystal turquoise waters, clean white sands, surrounded by rocky outcrops. Escape the tourist crowds and find some me-time, this is our next recommended thing to do in St. John. In this Eden-like setting, the waters are calm and the tide pools hide all sorts of exotic aquatic creatures. Explore on foot or snorkel in the water to get a better view. Then find a spot on the beach and pitch an umbrella to shade you from the sun. Once you have spent a bit of time relaxing, hike along the trail that leads to a nearby salt pond with the most amazing views of Drunk Bay. You can also hike along the Ram Hill Trail, a distance of about a mile, rewarding you with stunning views. We recommend setting up on a rock with a picnic basket and watching the amazing sunset an incredible thing to do in St. John! Climb onto a boat and head out to the islands best-kept secret off the north shore. Whistling Cay is a small island, only accessible by boat and offers a deep water snorkelling area, which is a must thing to do in St. John. The area is extremely special because of the crystal clear water that lets you see the gigantic coral formations below. Admire this underwater world from the boat or get wet by jumping into the water and snorkelling. Experienced divers can scuba dive into the depths to take a closer look. Because of the depth of this spot, snorkelers and divers are often treated and can see very large fish such as the tarpon that is not found in the shallower snorkelling spots. If you prefer to explore and remain dry, take a walk to the east side where an old stone structure can be seen. It is known locally as the Old Customs House, however it is believed that it was an old guards house in the 1800s and was used to spot slaves trying to escape through the channel to nearby Tortola. Just when you think you have snorkeled at all the best spots around the Island, we recommend another great thing to do in St. John. Waterlemon Cay is a small cay located in Leinster Bay on the north tip. It is surrounded by a fringing reef and is considered as one of the best spots for snorkeling. 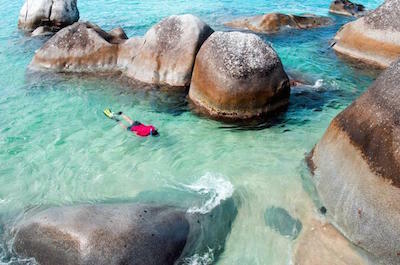 This off-the-beaten-track piece of paradise is reached by a 20 minute hike along scenic and flat terrain, making it crowd free and ideal for the serious snorkelers. Enter the water at the small sandy beach just west of the Cay or at the boulder shoreline adjacent to the Cay. The Cay is perfectly protected from wind and waves and you can see green sea turtles, sting rays, conch and large orange and yellow Cushio starfish. The dramatic reef offers stunning corals and rock formations. If you choose to swim on the far side, be aware that strong currents to occur from time to time. 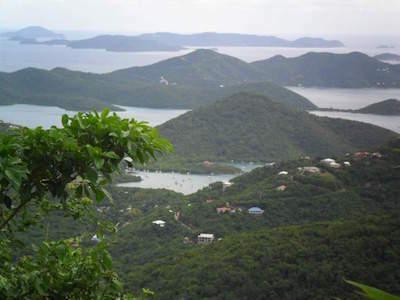 Hiking is the next awesome thing to do in St. John. Explore the Reef Bay Trail that offers 3 hikes for experienced, average and beginners. The trails take you into the tropical forests where magnificent waterfalls, fresh water pools and caves are found. See the exotic fauna and flora and watch out for deer, bats, crabs and termite nests. You can also explore the ruins of the old sugar mills Look for the petroglyphs, mysterious carvings of the Taino Indians, done more than 1000 years ago. These sacred symbols will send shivers down your spine. If you are doing the experienced 3 mile hike, dress in suitable gear and take water and snacks with you, it is a strenuous climb but well worth it! At the end of the trail you will find yourself on the beach, so a swimsuit is a must for cooling down. Guided tours are available with a local guide who knows the area well. 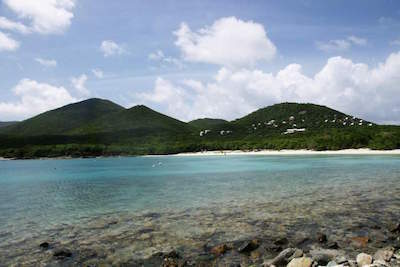 Cinnamon Bay beach is located on the central north coast and is one of the longest beaches on St. John. A visit is a certain thing to do in St. John. The beach has great facilities that include camping site, snack bar with a grill, a quaint souvenir shop, showers and restrooms. Watersports lovers can enjoy snorkling, kayaking and swimming. Scuba divers can explore the wreckage of a small aircraft in the deeper waters. One side of the beach is calm, the other offers waves for surfers to try out their skills at balancing. The lazy can just relax under an umbrella or on a chaise lounge under a palm tree and soak up the vibe, which is a popular thing to do in St. John. This beach is huge and although it gets busy, there is ample space for some solitude. If camping is for you, pitch a tent, rent an eco-tent or a small cottage. If not, head back to your luxury hotel for dinner and cocktails.